This entry was posted in FUN!, Mani Mondays and tagged Accessories, Beauty, bling bling, Blog, cabana boy, diamond pinky ring, diy, entertainment, family, fashion, french manicure, gaming, god daughter, Godmother, Humor, inspiration, invaluable treasures, Life, mani, manicure, niece and nephew, Orly, orly oh cabana boy, orly rock solid, personal, Seche Vite, Seche Vite top coat, shopping, sparkly, style, twins, two coats. The baby looks like she’s thinking ‘who the f#ck are you again?” Lol. How does that work with twins? Are you the godmother of both or just the little lady? Ha! She does look like that because she’s only seen me twice so far in her short life! And I’m her Godmother only, although I do think that I could have been both – my sister just decided to spread the love. I’m not sure how that typically goes! I hope a certain grey furball has been on his best behavior. Oh he’s been on his best worst behavior! 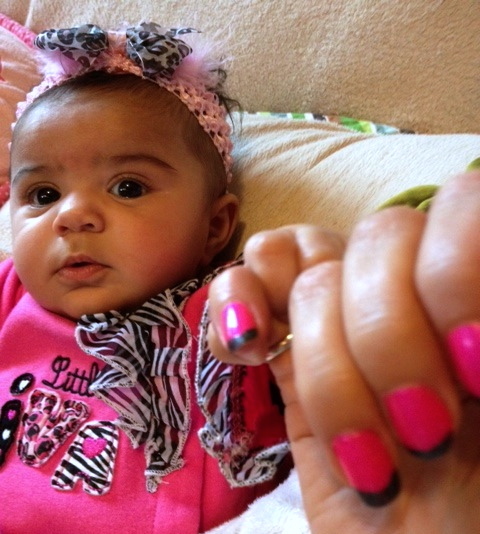 The babies loved your mani! Perfect choice! 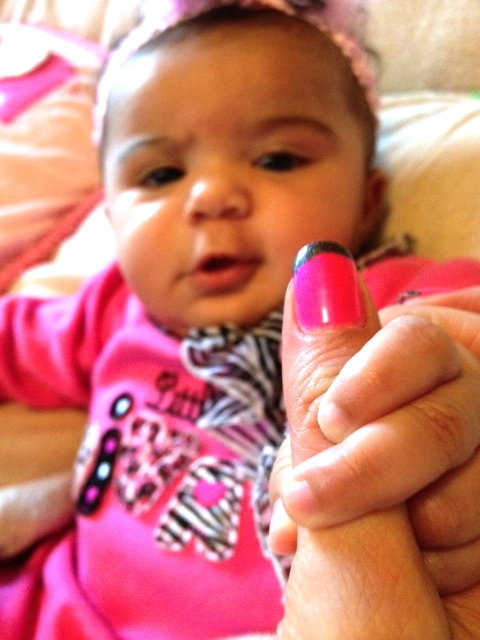 She takes after her Auntie CBXB! Wish I had the patience for French manicures…and the steady hand. It took me about 400 hours and 52 Skinny Pirates to perfect. If you notice, the camera doesn’t get too close…! Um…WOW! I’m away from your hilarity for a few weeks and I return to find an accomplished nail blogger! 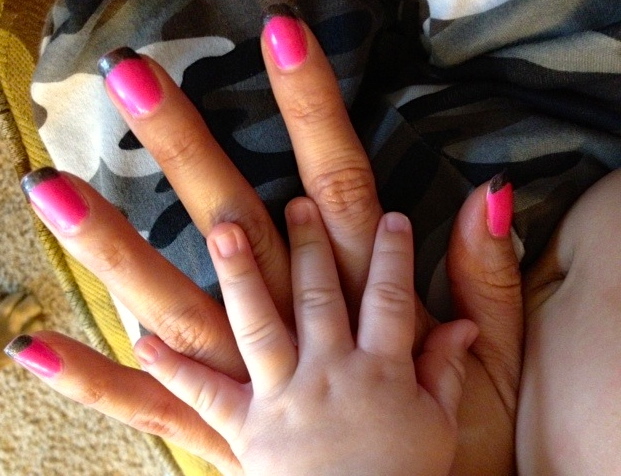 You really should do this more often…you have great nails. Oh…and that pic with the two hands…MELTING. Oh please! I can’t hold a candle to the master nail Goddess! I just enjoy painting my nails and feel my audience MUST see what I come up with weekly! 🙂 I know…the little hand….! Haha I love the combination! Her grabbing your ring reminds me of when I first got my dog Holly. She would grab a hold of my diamond ring with her teeth and try her darnest to get it off – it sent me into peels of laughter – it felt so funny and she was so determined. Like, “this shouldn’t be here – I just think it shouldn’t”. I was sad when she accepted it as a permanent part of me. OK that was totally not related. haha! Always love the nails! You sure blend right in. (Maybe it’s the camo?) Great job on the perfect mani! Haha! Yes! It’s the camo that makes me blend in. Thanks for noticing! Oh pink is her favorite color, already. Thanks to yours truly, of course! They are the cutest little twins ever (and I am very biased, of course!). Thank you for your sweet comment! What sweet photos, they are growing up so fast! Still waiting on the Teddy-Mani. Well, don’t hold your breath too long yet. I’m still trying to get Teddy over my trip to Key West and the sombrero and poncho stunt I pulled. 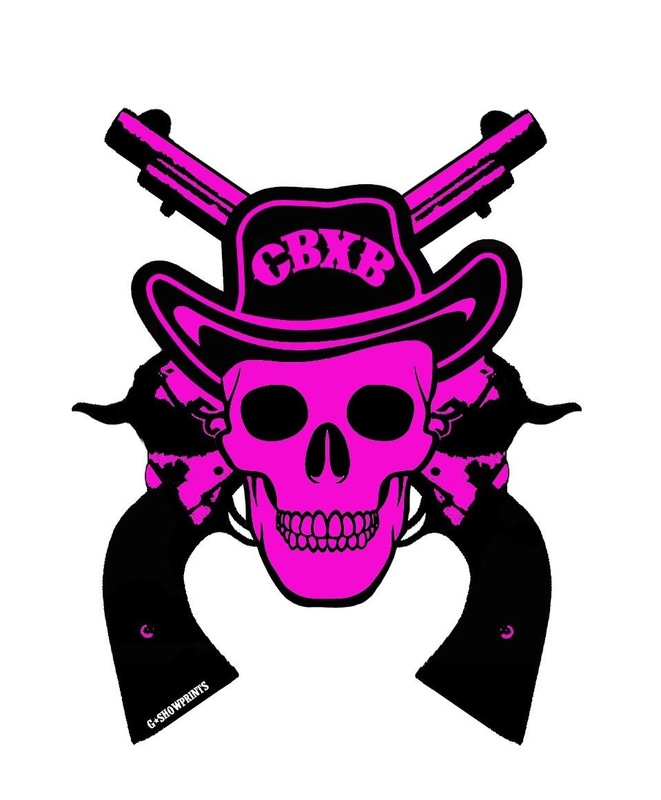 BUT I have found a pink that would look fabulous on him….